We are a premier hot rod shop located in “Race City”, U.S.A. specializing in all builds from pro-touring, resto-mods, hot rods, prestigious restorations and vintage race cars. Keith’s passion for cars was instilled within him at an early age. Born in Warren, MI. Keith was a stone’s throw away from “Motor City”. His first major exposure to cars was at the Woodward Dream Cruise and Autorama where thousands of people from around the world bring their hot rods for display and cruising. Keith is passionate about prewar hot rods, vintage racing and resto-mods. His first car was a ‘71 Nova. 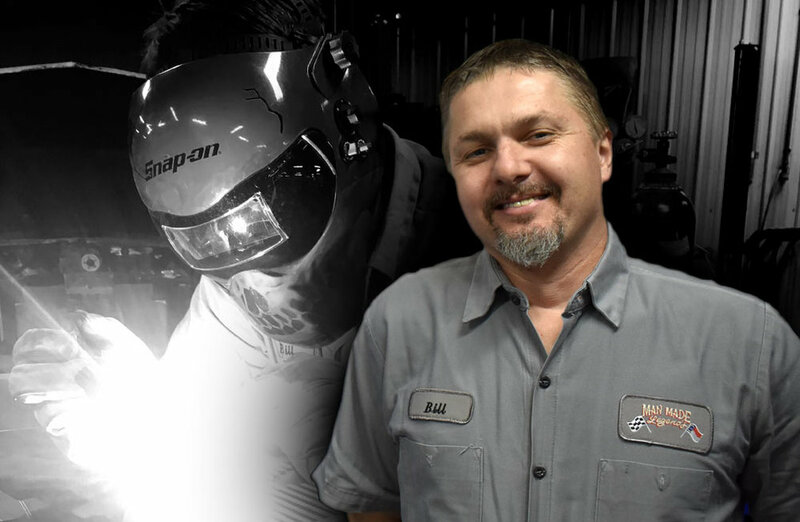 During the day, Keith has established a long career in Manufacturing with Ingersoll-Rand and General Electric. At night, he loves to research restoration projects and working around the shop. He is co-owner of Man Made Legends with his wife Leslie. They have 3 boys and live in Davidson, NC. When Keith isn’t dreaming up ideas for hot rods or working at either job, he enjoys fishing. Leslie grew up around cars in Pikeville, KY. Her father was a “car guy” and was always bringing something new around, which peaked her interest at an early age. One of her first cars was a Chevrolet Camaro, and throughout her life, she’s also owned a Corvette and El Camino. Her current love is "Sally" her 1966 Ford ½ -ton truck you see on our site. Leslie is an avid early American antique collector and spends time hunting those finds while husband, Keith Sultana, hunts for car parts. She’s always looking for that piece of furniture or art that captures what the American spirit is all about - the freedom to do, build and be anything you want. When Leslie isn’t chasing their three boys, or antiques, she enjoys studying interior design and helping stray animals. At an early age I was introduced into Hot Wheels and my passion for the automotive industry started. Being around cars was just the way of life since I was little. My father has a 1957 Chevy Belair that was passed on from his grandfather for his first vehicle. I grew up with that car as part of my family. At the age of 14 I started interning at a local shop in Riverview FL learning about fabrication, wiring, and building one off custom vehicles. I then moved into the interior and audio side of the builds and relocated to Charlotte NC. As an avid car show goer, I learned a lot about what people want and expect out of a build. I have an extensive background in all types of automotive fields such as electrical, suspension, audio/video, interior, metal, and fiberglass fabrication. I am an all around car guy with very high standards when it comes to quality, integrity, and exceeding customer expectations. I love making people’s dreams come true. As well as helping preserve their memories with their friends and families by building their dream car. Currently I am working on a 1955 Belair to enjoy with my wife and daughter. The greatest joy is to see our customers enjoy their vehicle again. Your passion is my passion. I and the rest of the MML crew can make your dream a reality. At age 12, I purchased my first vehicle, which was a 1959 Chevy El Camino. My love for the automotive industry expanded into asphalt stock cars. It was then that I honed my skills in welding and fabrication repairing my racer. This also sparked an interest in suspension systems. After studying suspension for many years, I went to work for a Nascar truck team. Expanding my skills, I went to work for a company pioneering electric car builds. In 2009 as a Crew Chief, I set a land speed record at the Bonneville salt flats. Moving into 2010 as a driver, I won the X Prize alternative side by side completion with my team. Through the vast racing experience I have perfected my skills in welding, power engine tuning, fabrication, and wiring. My love for the industry is to build the vehicles to go fast and be beautiful through craftsmanship and innovation. Growing up I was always into go-carts and dirt bikes. My interest in the automotive world really started when I was 15. At that time, I purchased my first vehicle which was a 1986 GMC Sierra. I began to get it road worthy and started with minor repairs and a full body paint job. Shortly after I turned 16, I started an internship at a local auto restoration shop learning the skills needed for the industry. As time went on I purchased a 1971 Chevy Monte Carlo as a project car. I wanted a clean, unique, and fast driver. The Monte Carlo project started with rust repair and has transitioned into dropping a 408cid 630 horsepower 6.0 Nighthawk LS into the frame rails. As the project continues, I am getting a degree in mechanical engineering, working part time and putting time in on the Monte, when I can. I have always enjoyed the style and uniqueness of older cars. Modern cars are designed to be aerodynamic and safe in case of an accident, but lack the character that a classic car has. Seeing them brought back to life while incorporating some of today’s technology to improve nearly every aspect of driving is always exciting and a rewarding experience to be a part of.